This the first of three very lengthy posts about the day we crossed the Cambodian border from Thailand. It was a long and weary day, but full of so many learning experiences and details that it became one of the most memorable of the trip. Travel can often be frustrating, confusing, and uncomfortable, but without these challenging moments, the journey can lose some of its power to change and teach us. Part I is actually about a positive experience in the day, several hours in which I spent communicating with someone else without having the luxury of a common tongue. I think one fear many people have about traveling to foreign places is not knowing how to speak to locals and being put at a disadvantage because of that. While that can be a valid enough concern, I wanted to share this story to show that being well-versed in the local language isn’t always necessary and even when you feel awkward, every effort you create towards connecting with another person will make you all the richer. Asia and I were headed to Cambodia from Bangkok the cheapest way possible, by train for $1.50. The ride was 7 hours long and left at 5:30am. We had been warned by a travel agent that the bus was ‘for poor people and dirty backpackers,’ so we knew it was perfect for us. At 5 the morning, we left our hostel across from the Hua Lampong train station and easily picked up a couple tickets shortly before the train left. Amoung rows of flower sellers, whose wares were stowed up in the luggage compartments, we found seats, one of which was next to a small Thai man who motioned me to sit. As the train jolted to a start and started to slowly creep along the still dark streets of Bangkok, we passed poorer neighborhoods and the light from their makeshift shacks peeped out through cracks in the walls. Some of the shacks had no wall at all facing the train tracks, so as we clanged past, we got precious, intrusive glimpses into their inhabitants’ homes and lives. 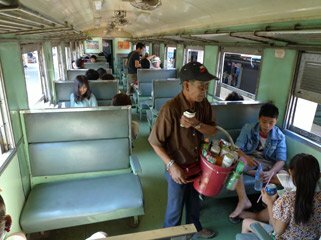 The conductor started to come along each seat, collecting tickets, and the Thai man next to me handed me his then promptly fell asleep. I held onto it until the conductor got to us, gave him our tickets, and then held on it again until the man awoke. When I gave him his ticket back, he reached into his bag and handed me an orange. Not wanting to be rude, I took it with a quick kor-kun-ka (thank you). I have to admit, I’m not much of an omnivore, preferring my fruit to be nicely diced, in smoothies, or at least washed. But still, I wanted to show him my gratitude, so I awkwardly peeled it and started eating the warm slices of orange, with most of my gratitude focused towards the fact that he didn’t give me a more exotic mystery fruit. The man watched me eat in silence, and when he saw me wrapping up bits of the peel into a napkin, he pulled out a plastic bag and had me throw my peels in there. We sat there for a little bit watching dawn break over the countryside, Asia asleep on the seat across from me, until he broke the silence with something in Thai. I leaned in closer, as if him repeating it would somehow help me understand better. But it was a question of some kind and he pointed all around at the train. I had a slight suspicion that he was asking me where I was going and this was shortly confirmed when he pulled out his train ticket and pointed to his destination. I pulled out mine and showed him the stop for Arunyapratet, the Thai border town. He smiled. I smiled. He nodded. I nodded. We sat in silence for a while. Then, I had a brilliant idea. Remembering that my Lonely Planet Thailand book had some words and phrases at the back of it, I went to pull it out of my backpack. Unfortunately, I am an excellent packer and the book was shoved so far deeply into it, that extracting it took more effort than I had expected. It was like my backpack was a pregnant cow giving birth, but the calf wasn’t coming out and I had to reach in there and turn it around. These are the metaphors my brain comes up with when I’ve been elbow-deep in my backpack for five minutes, nodding and smiling reassuringly at a confused Thai man who is staring at me. On a train. But finally, I triumphantly yanked the book out and flipped to the language section in the back. Unfortunately, Lonely Planet’s language selection was meager at best, half consisting of random types of fruits and vegetables. But I found the phrase for ‘that was delicious!” and pointed to it and to the remnants of the orange. The man smiled widely. I then tried to look for more useful phrases, but with a lack of material, I pointed to words like ‘train’ and gestured excitedly about like a child. He entertained that for a little bit, then started flipping through the phrases himself. He found the words for “aisle” and “window” and very sweetly motioned for me to switch with him, so I could sit by the open window. I declined at first, not wanting to take his seat from him, but he insisted. Continuing to look through the book, he found ‘hotel’ and asked me something about that…I assumed he was wondering where we staying, perhaps. I took the book back and flipped to the map at the front. I showed him our route and that we were eventually heading to Siem Reap today. Then, with my finger, I drew out our route through Cambodia, Laos, and back through Thailand. He got excited when I pointed at Northern Thailand and said “Chiang Rai!” and made lots of gestures to show this was a good place to visit. This, of course, was the most eloquent, non-conversational way to warn me about visiting the Thai-Malaysian border, a region plagued with separatist violence, civil strife, and, as he said, bombing incidents. I laughed and shook my head to say we were not going there. We flipped through the book a bit more and he found a picture of someone serenely getting a massage. He pointed it and I mimed getting put into a headlock, as per my own experience with Thai massage. He laughed and mimed getting his temples rubbed. I mimed back a very exaggerated temple rub, with my eyes rolling and a look of agony on my face, as it had felt like the girl giving me my massage had a personal vendetta against my skull. He laughed again. Success. Eventually the man took a pen and using his hand for a notepad, wrote something a word and showed it to me. He used English characters so I read it out loud. He nodded and pointed to himself. I pointed to him and repeated the word and he nodded. Wait, his name? Didn’t we already do this? And this was definitely a different word than before. Most unfortunately, I have discovered that Thai/Cambodian/Laos words stick to my brain as well as butter sticks to Teflon so I couldn’t remember either name as soon as I got off the train. But anyway, he had his name written on his palm, and then gave me his pen and stuck out his hand, so I wrote ‘Heather’ and ‘Asia’ on it. He nodded, and wrote ‘37’ by his name, so I promptly wrote ‘23’ and ‘25’ by our names. “Maaa?” He shook his head and repeated it a couple times, awkwardly and slowly, until I realized it was English. Oh! Man! He pointed at me questioningly. Ohhhh….man….. Yes, I laughed. I have a man, in USA! He pointed at the still-sleeping Asia. Would we return to Bangkok? Yes, I said, but not for long time. I took the map again and showed him our whole route and how we wouldn’t come back to Bangkok until we had gone through other countries. He then took up his palm/notepad again, rubbed out all our names and wrote another Thai word in English characters. I didn’t have a clue, even as he repeated it several times. Then he wrote ‘1-2-3” under it. Number? He nodded. “Bangkok,” he said. “I don’t have a Thai number,” I lied. I shook my head and shrugged my shoulders to convey this. Oh. He nodded. I nodded. We sat in silence. It was awkward. I wasn’t sure if I was taking it entirely the wrong way, but I had no clue what else he was asking for, or even why he would want my number…we couldn’t exactly chat over the phone. But the rest of the time to his stop passed uneventfully enough. Occasionally he would point to fields out the window and show me the words for ‘rice’ or ‘bananas,’ and once he pointed to word ‘bathroom’ to ask if I needed to get up and use it. When he got to his stop, I warmly said goodbye and he waved at me and hurried off the train. I felt a bit more validated in my impression of what he was asking for later in my trip, as other Thai men inquired about my marital status and even got a bit cheeky at times. But regardless of intent, I was really happy with my gawky, hobbled-together interaction. I had tried, and for the most part, succeeded. Instead of keeping to my own comfortable bubble, I had expanded it and briefly brought a stranger inside.